From Williamstown, Spotswood and Newport close to 1800 enlisted over the period of the Great War (now known as World War 1). 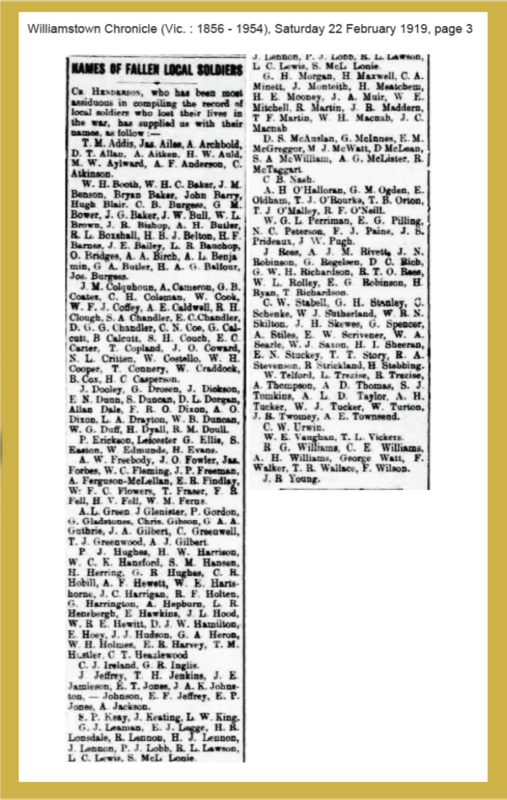 The portraits of 265 men who did not return from the war to their families are presented on the Williamstown Town Hall Honour Board. For the people of Williamstown, Spotswood and Newport the Board is a place of remembrance of those who sacrificed their lives. Hobsons Bay City Council’s Sons of Williamstown, A Labour of Love project, supported by the Australian Government’s Anzac Centenary Local Grants Program set out to conserve, research and document the Board and share the stories behind the faces. William Henderson, Williamstown Councillor from 1916-1928 and Mayor from 1919-1920, collected the portraits of Williamstown, Newport and Spotswood men who died in the Great War (World War 1). William Henderson’s devotion to this task became known as his ‘Labour of Love’. By 1924 he had collected a total of 265 portraits. To display them the council contracted the well-known Melbourne firm, H Goldman Manufacturing Co., to build a blackwood cabinet with doors designed to protect the photos against light damage. To read more about the Honour Board please visit our Honour Board Page. Our research shows that since 1924 this extraordinary memorial has been located at a number of sites within the Williamstown Town Hall at 104 Ferguson Street, Williamstown. Today the Honour Board hangs in the Town Hall Ballroom Foyer. Nearly a hundred years on the plywood panels framing the photographs were gently buckling and pressing the gilded lettering to the glass, the names of our local soldiers, sailors and airmen were slowly disappearing. Nearly a hundred years after it was created, it was time to preserve the names of those who gave their lives in World War 1 and to tell their stories. Specialist conservator, Jude Schahinger, conserved the Board by cleaning, repairing, regilding damaged lettering and providing acid free support and backing material. She gently steamed the plywood to flatten buckled areas and also repaired external timber where an unsympathetic hinge had been installed. Jude installed spacers to prevent the plywood and lettering coming into contact with the glass. The Board was professionally photographed by Rob Lawler. Rob carefully photographed the portraits and created a digital archive to enable the publication of the individual portraits of each of the men. As the Board was being conserved and photographed the project team conducted research to establish the story of the Board. We discovered the stories behind the creation of the Board, about Cr William Henderson who worked for many years to gather the names and portraits and of the Mothers and families who were grateful to Cr Henderson for what he had done to perpetuate the memories of those who were so dear to them. Please go to our Honour Board page to read more. Using digitised records, resources from across the world, information from local communities and artefacts from families we established and confirmed identities of the men on the Board, their connections to Williamstown, their service histories and their stories. Through a series of talks, social media and the creation of the Sons of Williamstown, A Labour of Love web site the stories behind the faces on our Williamstown Town Hall Honour Board are being told. For the service records we consulted the digitised military records at the Australian War Memorial (AWM) and the National Archives of Australia (NAA). We sought further information and cross referenced through the digitised newspapers on the National Library’s TROVE site, the National Anzac Centre, AIF Project, Commonwealth War Graves, family histories, other memorial honour boards, both local and further afield, school histories and miscellaneous published and unpublished records. We sought information from the community, such as the Williamstown Historical Society and the relatives, the descendants of the men on the Board – because we know these men were more than just words on their service records – they were members local cricket, football and lacrosse teams, they sang in the church choir and they left behind families who loved and cared deeply for them. Our starting point was the Australian War Memorial’s Roll of Honour and Circulars which records and commemorates those who died. In the 1920s Historian, Charles Bean sent circulars to families as he wanted to know more about those who didn’t return to Australia’s shores. He wanted to know more personal details of the men: where they were born, went to school and their main location of association. Even though not every circular was returned, those that were, were invaluable for our project as they enabled us to confirm the Williamstown, Newport or Spotswood connection for many of the men. We consulted the digitised service dossiers held by the National Archives of Australia to obtain dates of enlistment, embarkation and death. These dossiers also record the date of death, the casualty records, approximate place of death and how a serviceman died. Description of death was often ‘died of wounds’ or ‘killed in action’. 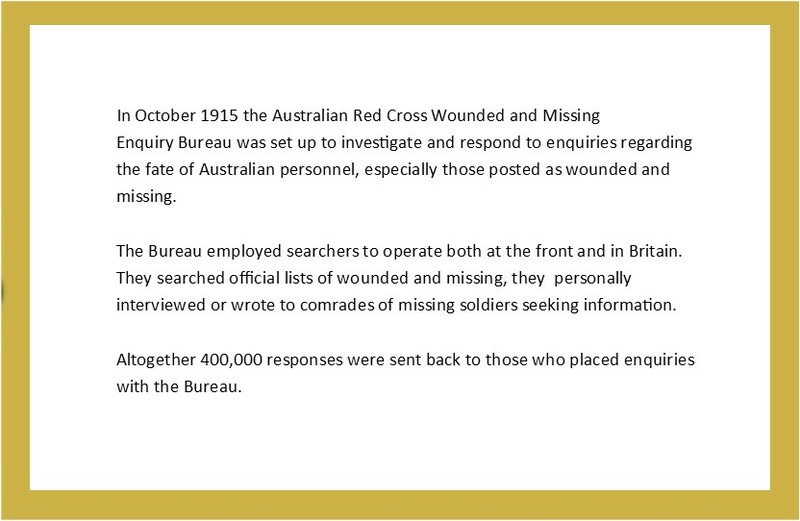 In some cases we found more details about a death through the Red Cross Wounded and Missing Enquiry files, private diaries and letters sent to families and published in local newspapers. Our navy men were a little more difficult to track down as navy records are not digitised. Once we found what ship a man served on, we had a better chance to find out how he died. We found some naval men on the British Naval Memorials at Plymouth, Portsmouth and Chatham; one of our sailors on AWM’s Boy Soldier list and another two in a 2010 thesis written in Queensland. We came across a few interesting challenges – names misspelt, errors made when names were written on the board and men enlisting under aliases. We’ve identified and proved the local connection for most of the men, however we still have some mysteries. 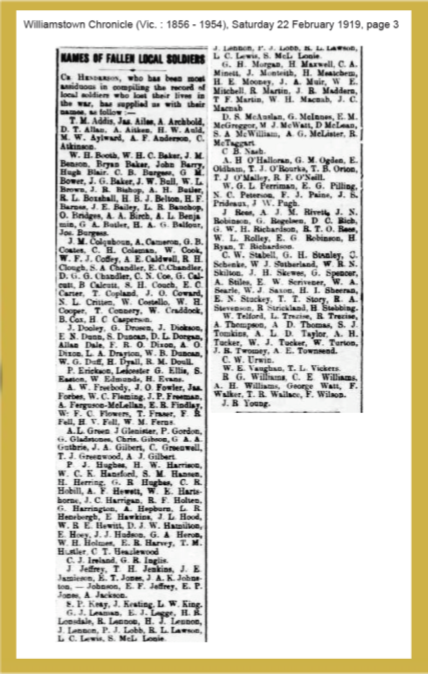 We compared names with the published 1919 list ‘Names of Local Fallen Soldiers’ on this page. For instance we have two portraits labelled J H Skewes – there is one J H Skewes on the list and a G H Stanley who isn’t on the Honour Board. Even though there is an R Martin on the North Williamstown Presbyterian Church (now St Stephens) honour board, we are unable to find him on either the AWM or the NAA records. Stories of compassion and kindness – a bible is returned to a family back home with the words ‘I thought relatives and friends would be glad to receive it as a memento of a life laid down for a noble cause’. These and many more stories are available in the individual biographies on ‘The 265’ page. David and Emma Chandler’s sons, Robert, Dave, Eddie and Steve. The Sons of Williamstown Project would like to acknowledge the gracious assistance of the Hobsons Bay community and many local organisations, as well as the kind generosity of relatives with close connections to the Honour Board who shared family information. Thank you. We have yet to confirm the identity of eight men, please visit our Alphabetical List page to see who they are. We have made every effort to ensure names and details are correct and ask that you contact us if you believe an error has occurred or you can help us with an unidentified portrait.